When we think of responding to RFPs, we often picture the “wrangling” that happens with content and its many contributors. Some might say wrangling just comes with the territory. Others using RFP software will offer a different perspective, and tell you there are ways to work smarter. As an SME (Subject Matter Expert), your time is precious—even still, devoting a portion of your time is a necessary part of the RFP response process. SMEs wear many hats, yet the one hat they all have is the value-add with RFPs. With the right technology, we can reframe the entire RFP response process and create a wrangle-free environment. Imagine your day without the fire drills, repetitive tasks, and struggle to find content. An intuitive RFP platform eliminates those variables to free up your time. Let’s move on to happier times with RFPs, shall we? We’re stepping into your SME shoes to explore the common challenges you face, and how combining strong technology with a better process helps you focus on other business priorities. If you’re ready to dedicate time to improving your organization’s RFP response strategy, this one’s for you. Who is an SME in the RFP Response Process? Subject matter experts are some of the most critical contributors in the RFP response process. Being a team effort on the grandest scale, collaboration from multiple team members across departments is the norm. This is where you come in. Call it your reward for being the expert. We hear you chuckling over the “reward” comment, but hear us out—responding to RFPs can be a rewarding experience rather than a negative one. It all comes down to an efficient process powered by an RFP response solution. 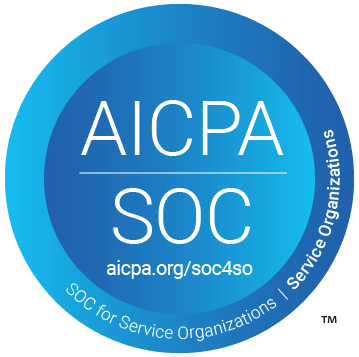 Since nobody’s title is actually “Subject Matter Expert,” an SME at one organization will do something entirely different from another. The common thread is that an SME’s expertise is in high-demand during the RFP response process. A proposal manager or proposal writer needs their input to create the most accurate, spellbinding RFP responses possible. Within the RFP response process, as an SME you are either a: contributor, project manager, or both. At a larger organization with a dedicated proposal lead, you might contribute to specific sections or questions. However, if you’re at a smaller organization, you might be the proposal lead AND the contributor. Whether you are juggling multiple tasks as a contributor or project manager, you likely have other job responsibilities and high priorities on top of that. Things can spiral out of control very quickly for SMEs, which is why it’s important to stay rooted in the purpose behind every monumental RFP effort. Are RFPs a waste of time? Well, it depends who you ask. According to The Standish Group, “In contrast to small projects, which have a greater than 70% chance of performing well, a large project has virtually no chance of coming in on time, on budget, and within scope.” A successful organization with an efficient process will always see the positive side of RFP response. A chaotic one schlepping along with a manual process won’t be able to see past the inefficiencies they are challenged with every day. Responding to RFPs Creates More Opportunities – If your organization doesn’t respond, you can bet one of your competitors will. Every RFP you submit should position your organization as the obvious partner. That means carefully crafted content that is tailored to each prospect. Responding to RFPs Revitalizes Internal Knowledge – Staying on top of the latest internal knowledge is critical for any organization, whether you have a team of 30 or 30,000. Outdated content works against the end goal of any RFP…to win business. Staying on top of your answer library is a must for every team. Responding to RFPs Generates More Revenue – The reason for responding to RFPs comes down to revenue generation. Turning away from RFPs happens because of the time commitment and a potentially low win rate. Automating repetitive tasks and streamlining the workflow are key for protecting resources. Responding to RFPs Brings Teams Closer Together – Information silos happen to even the most well-intentioned teams. Since these silos bring the RFP response process to a standstill, content accessibility and open communication must work in tandem. Non-email communication channels are helpful here. From easier access to internal knowledge to better verbal communication, a stronger RFP response process delivers ongoing positive effects. Technology is often the missing piece of the process. Today’s proposal management teams are using RFP response software like RFPIO to be more productive and do their best work. SMEs exist in all functions and disciplines of a business, but it is quite common for organizations to have subject matter experts in IT, product management, and software development. Meaning…SMEs tend to be a techy bunch. In the middle of this bustling technology crowd, tools like RFP software have joined the pack. SMEs are scouring the software landscape to figure out how to maximize efficiency. A decade ago, they had to rely on spreadsheets and folders to limp along through the RFP response process. Now, there are plenty of solutions to support them. Over the past five years there have been wonderful developments with content management, collaboration, and project management software. Having too much software is overwhelming proposal management teams. To combat technology fatigue, organizations are consolidating their technology stacks by finding single solutions that check all of the boxes. RFP software is that single solution—it takes the best of these worlds to streamline the RFP response process. At RFPIO, we work with SMEs who contribute their expertise, manage the RFP project, or a combination of all of the above. In such a demanding role, they need support to balance their priority list. Here are a few common questions we hear, and how RFP software like RFPIO helps SMEs overcome these everyday challenges. 1. How can I respond to RFPs when I never have the time? “Workers spent up to 25 minutes looking for a single document in over a third of searches conducted. In 80% of cases it took up to eight attempts to find the right information,” according to SearchYourCloud. RFPIO’s recommendation engine automatically brings you the best content in seconds, so you can move on with your day. It searches the answer library to find a relevant historical response that applies. From there, it’s up to you to tailor that content and increase the wow factor with your prospect. 2. Why do I never have the right content ready when I need it? RFPIO’s answer library is a centralized, organized knowledge repository. As an SME, you will have full accessibility to grab the content you need quickly. The days of hunting down historical responses in emails or online folders are over, my friend. 3. How come it seems like nobody is clear on who is doing what? 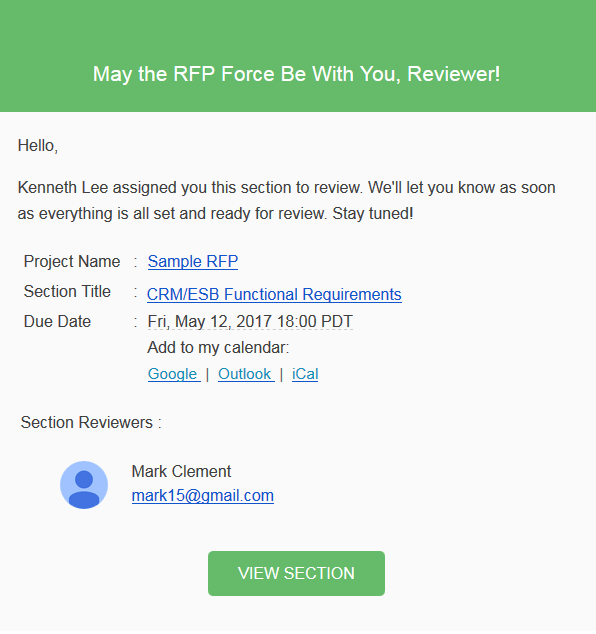 RFPIO’s project assignment features makes it easy to select SMEs as contributors and reviewers to avoid confusion during the review process. An email will alert you when it’s time to start an assignment, and remind you when the due date is nearing. An answer library report shows how many questions or sections each SME is contributing to. This is useful for divvying up work when one SME is overloaded and another has availability to take over. 4. What are the questions I actually need to respond to? RFPIO’s filtering mechanism allows you to filter by section or project to locate your assigned RFP questions. Advanced filtering shows content assigned for follow-up when additional expertise or clarification is needed from SMEs. This brings focus to your RFP contributions, because you go straight to your assignment and skip what doesn’t concern you. 5. How do I raise a clarification externally? RFPIO’s clarification function allows you to track all the comments from the issuer—who you can invite to use the solution. Uncertainties about language or requirements inevitably come up with RFP responses. It’s helpful to have a way to capture the specifics, without resorting to back-and-forth emails. 6. How do I communicate with my team internally? RFPIO’s communication options are aplenty to encourage easier collaboration and less clutter in your inbox. You can raise clarifications, start a discussion about the question/content with the comments feature, and mark questions for follow-up. Global chat is another breezy way for users to collaborate, one-on-one, like you would in Google’s Hangout Chat. Lastly is a favorite communication platform, Slack. RFPIO’s Slack integration brings you an instant messaging tool for solo or group conversations to help you work through the RFP project effectively together. 7. Am I sure this RFP response is worth my time right now? RFPIO’s intake request is a form that allows the sales team to communicate with the proposal or bid team on a new opportunity. This evaluation period determines whether or not the RFP is worth the pursuit. If the opportunity is the right fit, then an SME will become involved in the RFP project. With this step in your RFP response process, you will spend less time responding to RFPs that have a lower success rate. Your valuable time will be better spent on opportunities with higher win potential. 8. How do I know what content to use? RFPIO’s knowledge base can be used for RFP responses, or any other time you need to quickly access important company information. When content is conditioned appropriately, you can tag responses in an organized fashion that makes sense for your team. Star ratings ensure the strongest RFP responses are presented first, while reducing or removing weaker content recommendations. 9. How can I see where I’m at with an RFP project? RFPIO’s project overview dashboard offers progress tracking for your RFP project. This makes it easy to see how many questions you have left, so you can feel a sense of accomplishment and keep racing toward the finish line. A little encouragement goes a long way when work is stacking up, right? You’re the expert, and an RFP just doesn’t work without your input. While it can be challenging to find time to respond to RFPs, you understand the positive impact for your organization and you make the time. As with any project that requires close collaboration, obstacles and miscommunication come with the territory. It’s up to you as an SME to move past these obstacles, so you can share your expertise and return to your priorities. RFP software will cut your response time in half and help you refocus your energy. Why not give it a try? We know you have a jam-packed day, but you made it this far. Sounds like you’re committed to discovering a better way with RFP response. 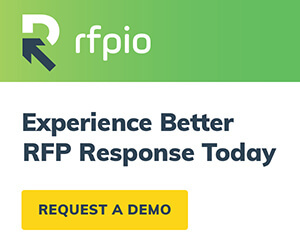 Next steps are simple…schedule a demo to get started right away with a better RFP response process.